In a real life scenario, automation framework is designed as a structural and conceptual module that provides high extensibility, maintainability, libraries, and guidelines for future development. The following are basic steps to help start designing and implementing automation framework using Selenium Webdriver, J-unit, and Java in Eclipse IDE. If you missed part one of this tutorial, don't worry, just click here. Once you choose a framework, set up your project in the given IDE. -Download any latest version of Eclipse, but make sure you choose the correct type (e.g. Eclipse IDE for Java developers). -Create Java/Maven, or any relative project in Eclipse, or any IDE. When you create the Maven project, give meaningful names to the ArtifactID and GroupID. -Download Selenium Webdriver as the selected language from http://www.seleniumhq.org/download/. -Add the Selenium jar to the Eclipse IDE project by right clicking on Project, and then selecting Build path -> Configure build path -> Libraries -> Add external jars. -If you would like to run tests using Firefox, then download the most recent version of Geckodriver from https://github.com/mozilla/geckodriver/releases. -If you're choosing to use Chrome as a testing browser, then download Chromedriver from https://sites.google.com/a/chromium.org/chromedriver/downloads and save either driver in a specific directory. -Once everything is setup, you're ready to write the first automation (functional) test. Writing the first automation code: When you write automation tests for web applications, all tests are mostly click events. All user interactions with the system happen by clicking, selecting, dragging, and dropping events. Code sample for Chrome browser: This sample test will open Google Chrome browser. Go to google.com and click on the Gmail link. Check if the Gmail login page is displayed by checking page title. After it has been validated, the browser will close. Code sample for the Firefox browser: This sample test will open in the Firefox browser. Go to google.com, and click on the Gmail link. Check if the Gmail login page is displayed by checking the page title. After it has been validated, the browser will close. Now, let’s try a sample example for defining a page object model. In a page object model, every web page is seen as a WebObject, and every web element on that page can be considered a data element or member of WebObject. Each user action can be simulated as a web element action like click/submit/select or send text. // declare some functions and data members here available on the homepage. You can use Firepath/Firebug plugins to find the exact XPath or different locators for each web element. // Here you can call any method for HomePage web object. -Does not contain any kind of assertions. This can be implemented using a page object pattern by making the home page a utility class that will implement functionality and web elements on the home page. The sign in page can be used as one object for the login user, and then all other apps can be created as separate WebObjects that can be aggregated from the sign in page. All the web elements that are common to each page can be moved to some common class and declared as constants. Create a new package such as src/test/resources to add property files where you configure the details of a user ID, password, web app URL, and data files path. Create a separate test class where you can call required WebObjects shown in the examples above, and validate the test by using different assertions in your test. You can also minimize implementation by trying to avoid duplicating the same functionality. We can refactor the code above into the code below, to obtain inheritance in our test cases as well as improve readability and usability. Let’s say the login page is declared as a parent class, which will setup the driver/browser, and provide login functionality. Once tests are completed, it will close the browser. We can extend the LoginTest class, which will inherit properties from the Base Class and add new properties of its own, which can validate all login test scenarios. 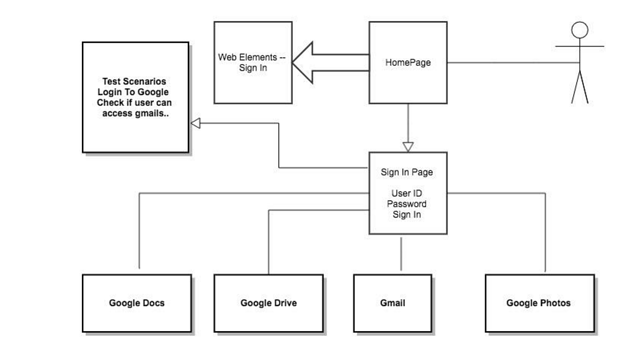 // Here you can call any method for HomePage/Login Page web objects. This is implemented in the base test class, but when you need multiple values for the same properties in your test runs, then defining properties in the property file is actually not good idea. In that case, either using CSV or Excel files is a better option. And that's it! I hope you've found this article helpful. I'd love to hear how this tutorial worked for you, let me know your thoughts and experiences. Meera Honde is a Lead Automation Engineer at Avenue Code. Meera loves to solve problems. Her hobbies include traveling, driving, cooking, and watching movies.